I was on a bit of a roll when designing these stamps and as I've been using them a lot lately to prepare for this week, I can certainly say that there is a lot of fun to be had, the plates mix and match beautifully which increases their versatility. The samples for tonight's post are based on sets 21/22, and tomorrow I have some more 'wingmen' who will work with sets 23/24. 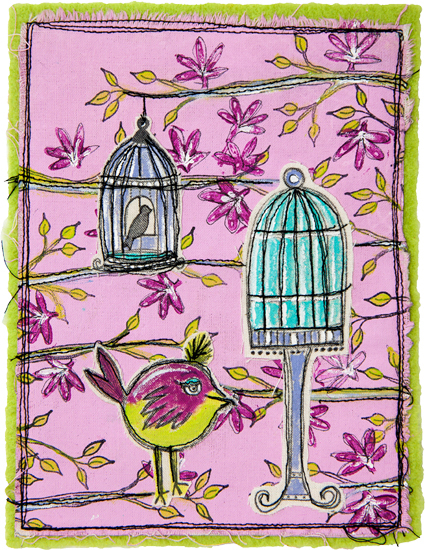 First up we have Helen Chilton, a regular contributor to Craft Stamper, and also to the PaperArtsy Blog. Helen often teaches at The Craft Barn in Surrey. 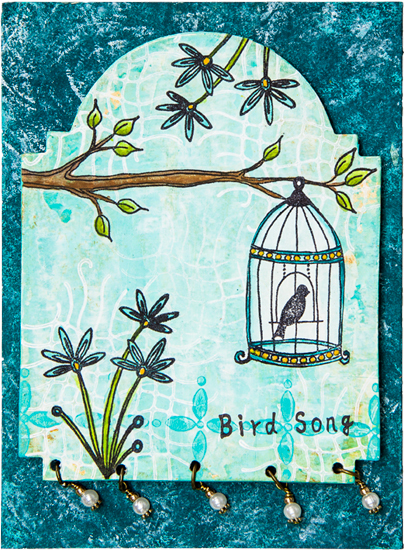 She is such a versatile crafter, and I love how she uses lots of stamped layers and bright colours in really imaginative ways! 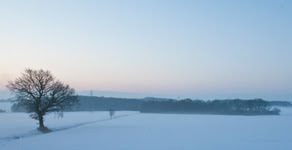 You can see Helen's work on her Blog 'A Splash of Colour'. The first project is made using glossy card with Distress ink pads to match the Fresco paint colours (Picked Raspberry, Twisted Citron, Peacock Feathers). I then stamped the text all over the background in the same inks and over-stamped the leaves and flowers with Fresco paints (Candy Floss, Hey Pesto, Caribbean Sea, Snowflake). I really liked the contrast in texture between the smooth glossy card and the rough, matte paint. I've sketched round the flowers in a black pen and added white highlights for extra detail. For this project I decided to work on fabric. I've used calico backed with an iron on interfacing to give it a bit more body. The three main images are on separate pieces of material, cut out and then stitched on. Here I've used the sewing machine like a black pen, stitching sketchy lines to give a doodly effect. Leave threads and frayed bits hanging to add interest. I put the whole thing onto felt and I've teased out the edges with a needle. Next up It's Lesley Ebdon. Lesley is a wonderful PA fan, and her cards are always so beautifully made with great attention to detail. I am thrilled she agreed to make some samples with these new stamps, You can see more from Lesley on her blog 'Crafty Love N Hugs'. I manipulated the lovely bluebell stem to create a hanger for the birdcage and used part of an image to get the impression of clumps of grasses along the bottom. I cut the quote into 3 separate phrases (I can still fit the lines together to use as a whole in the future) so I could get accurate placement round the colourful border which created a frame to showcase the gorgeous teasel stamped onto linen and softly coloured with Bougainvillea and Limelight Fresco Finish. My third card uses part of a useful background image to create a border and splitting a phrase into 3 lines to balance the design. Finally, I'd like to share with you a few of the items I have made with my stamps. My first project uses a strip cut from one of PaperArtsy's 8x8" grey/whiteboard as my substrate. I love this surface to work on, it accepts paint beautifully and because it has a white surface, I know the paint colour will be true. Step One: I stencilled some Snowflake Fresco Finish paint through my leaf stencil PS006 over a blended background of Tango and Tangerine Twist. When this was dry, I used a baby wipe to apply a thin layer of Tango to tint the white leaves. Step Two: Using Orange Blossom Archival ink, I started to over stamp some images to create an interesting background. The checker board from ELB22 lines up beautifully but I have to say the mesh stamp is going to be my new favourite stamp. 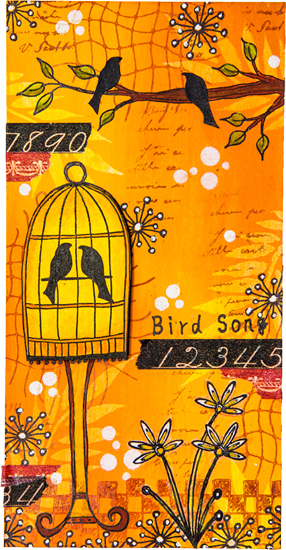 Step Three: I stamped the birdcage with Jet Black Archival ink on a piece of Smoothy cardstock that had been painted with Tangerine Twist. 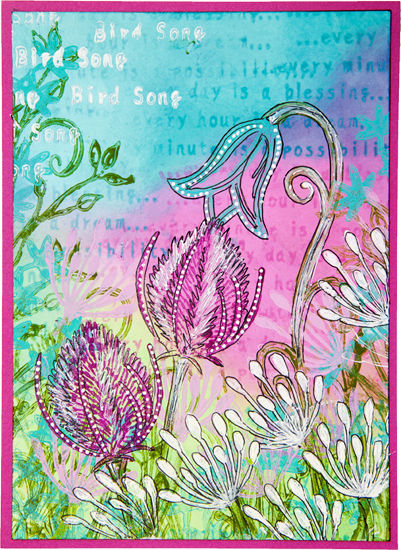 I was then able to add highlights with Tango before stamping the birds. Here's a close up so you can see some of the layout in more detail.....you will notice a second pair of birds. I actually stamped them on card and cut them out for precision placement but you could easily ink each one individually and stamp them separately. A little bit of Washi tape and a few Snowflake dots through stencil PS001 add the finishing touches. In case you are wondering what the script in the background is, it's MN61 an old favourite of mine. Step One: After creating the background using an old plastic card to apply Caribbean Sea and Snowflake Fresco Finish paint, I used Snowflake again with the mesh image and Caribbean Sea to stamp sections of the solid border. Sorry I got carried away when making this sample and forgot the step by step photos, so these are close ups of the finished project in order for you to see the detail. Step Two: Sometimes when I want to position an image accurately, I will use the "stamping on tissue paper trick". Not only does this mean that I can glue the image in exactly the right spot, it also means that I can paint the image from the front and back which allows me to use opaque colours without obliterating the fine detail of the image. Here's another close up ... I love how the little trio of stamps from ELB22 looks quite cool upside down!!! This project was made using the same technique and colours as the previous project but I liked the technique so much, I thought I would show you this sample too, the only difference is that it uses images from ELB22. I also realised that the head of my Bluebell could be used upside down to create another style of flower. I really hope you are going to enjoy using these new products as much as I have and that my guests and I have inspired you to want to create something like this with them yourself. Artist Trading Post, Wirksworth, Derbyshire, UK. Birds in the Barn, Marks Tey, Essex, UK. 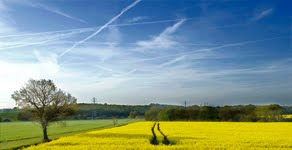 Countryview Crafts, Potton, Bedfordshire, UK. Frantic Stamper Inc, Oregon, USA. Imagine That Papercrafts, Essex, UK. Stamping Corner, Zuid Holland, The Netherlands. The Artistic Stamper, Faversham, Kent, UK. The Craft Den, Wisbech, Cambridgeshire, UK. The Forget Me Not Kraft Kabin, Rochford, Essex, UK. Don't forget, the Topic 12: Stencils challenge is open for an extra week while the new product announcements take place this week. You have until Sunday, July 12th 5pm London time, to link your art. Perhaps Lin has inspired you to do some metal work tonight? It's a perfect fit with the Shiny Stuff Topic!! !Perhaps Lin has inspired you to do some metal work tonight? It's a perfect fit with the Shiny Stuff Topic!!! These new stamps are so droolable, Lin, I definitely have to get them all. And you have two of my favourite artists as wingpeople! Lovely stamps & the samples are gorgeous. Congrats to Lin, Lesley, Helen & Kay. Wonderful new stamps and yet more AMAZING samples! Love the birdcages and the new flowers! I'm going to be so poor...!!! Oh WOW! I don't know why I need all of these stamps, I just do! They are amazing, all of them! How beautiful and delightful on this one the samples made by Helen, Lesley and yourself... Well done ladies, it is a fest for the eyes!! !